Without hurricane windows, boarding up coastal homes and businesses up has become a real expense in recent years. With an increase in both the frequency and severity of storms, having a plan and taking preventative measures for storm damage are becoming a more and more important. So with everything from permanent roll down shutters to board up plans, Jersey Architectural is here to help. Maybe your business is ready for some storm ready replacement windows? Give us a call today! Many of our customers need windows that are designed and tested to stand up to the most extreme coastal weather, so Jersey Architectural Door & Supply Co. regularly stocks hurricane windows in a variety of different impact-resistant ratings and designs from trusted manufacturers like Andersen™, Arcadia™, Ideal Window™, Wintech™ and SilverLine™. Our catalog of hurricane windows is accessible by contractor and homeowner alike, guaranteeing tested and certified impact-resistant glass and protection against flying debris and damaging wind. These structurally reinforced windows offer 24/7 protection from the elements without the inconvenience of having to constantly install, remove and store plywood or metal panels and shutters. Homeowners and business owners can rest easy during hurricane season knowing they have the safest, highest quality hurricane windows available on the market at industry leading prices. 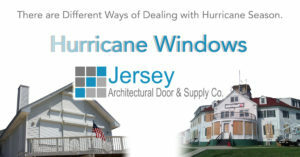 Choosing the right type of hurricane window can involve many factors, so Jersey’s team of in-house technicians and architects are here to help residential and commercial building customers get a window with integrity they can put their trust in. We can offer advice about a variety of storm-proofing options that meet local building code requirements, and help hone in on the perfect hurricane window for your home or business. Arcadia™ Windows manufactures ballistic, impact and blast-resistant windows in both thermal and non-thermal models. Their impact-resistant window designs and schematics are available here. Silver Line® Coastal Watch Protection by Andersen Windows comes with convenient integral nailing flange and J-channel for easy installation and trimming, with dual locking door hardware for added strength and security. Hurricane protection from Andersen is available in the company’s A-Series, E-Series, 400 Series, Weiland and Silver Line models. Silver Line’s Low-E4® Impact-Resistant Glass achieves all the benefits of impact-resistant glass and at the same time adds an insulating air space that helps keep buildings cool in the summer and warm in the winter. Silver Line also manufactures Low-E4 SmartSun™ Impact-Resistant Glass. This model has the advantages of Low-E4 glass and helps shield homes from the sun’s heat while filtering out 95% of harmful UV rays and still letting sunlight shine through. Also available is Silver Line’s SmartSun™ Monolithic Impact-Resistant Glass, which is reinforced with a clear plastic laminate sandwiched between two panes. This helps to shield a room against impact, forced entry and unwanted noise. Available in clear or gray. Jersey Architectural offers customers the added bonus of direct door-to-door shipping. Simply choose from Jersey’s one, five or 10-day QuickShip™ option to have your windows sent to you express, or choose free ground shipping. Have More Questions About Jersey’s Catalog Of Hurricane Windows?